“Christmas is the most wonderful time of the year!” And I am not saying this just to copy some song’s lyrics! It’s always been my all-time favourite Holiday and it will always be! This year I am doing my own version of Vlogmas on my YouTube channel, where I decided to film a Christmas Tag. What a nice idea of a video during a Vlogmas series, am I right? Therefore I thought how cool it will be to share it with my blog friends as well. Loved that I went back in time for a little bit and think about my childhood. So that’s why I posted this article for you today! Hope you’ll enjoy the reading! Are you in a hurry or you don’t have enough time to read? SAVE it for later! Have you ever had a White Christmas? Can you name all of Santa’s reindeer? Are you a pro-present wrapper, or do you fail miserably? When did you realize the truth about Santa? Do you make New Year’s resolutions? Do you stick to them? What makes the Holidays special for you? I can immediately say that my favourite Christmas film is the Home Alone series. I grew up with this movie. I watched it every single year on TV, so it became a tradition. Even now, many years later I’m still watching it and I’ll never get bored! I’ve had many white Christmases growing up! I remember being so so excited about snow and going to the top of the heels with my sleigh. All my clothes were soaking wet, but I didn’t care too much. I loved playing in the snow (even now as an adult), that’s why when I was in school I’d always go out to play with the boys during school breaks. I was the only girl who went out with them by choice. Not sure about you, but in our school, boys used to take the girls out to give them a quick little “wash” in the snow. That was our idea of fun! Sadly, with the years passing by, snow was not seen as much in my city anymore, so now, at 28 years old I am still enjoying seeing snow, just like a little girl would. I can’t wait for this year’s snow to come so I can take my 16-month-old to play with it. At home with my family, at least that’s what I used to do growing up and before I decided to live abroad. I remember being at home for Christmas and going away with friends for the New Year’s Eve. Now that I have my own little family of 3, I can still say that my number one wish for Christmas is to be at home with my parents so that my son can be with his grandparents, cousins and so on. But, let’s be real, this can not always happen, especially if you are living in a different part of the world. I don’t have any favourite song in particular, but I noticed that I tend to listen to the same artist every year. Andra is her name and she’s a Romanian artist. I just adore her music. She also sings Christmas songs. This is one of my favourite ones. Perfect! Always on Christmas Eve, after our carolling session was over. Who has the patience to wait for the 25th? I know for sure I can’t! As a new family of 3, we don’t really have many traditions set in stone, most of our traditions are ones that our parents had with us as kids. So, I am definitely looking forward to creating our own little family traditions. Just to answer the question a few of my favourite traditions would be the family lunch table from the 25th, opening the Christmas presents, taking pictures in front of the tree and others. Fake at the moment! But growing up we always had a real Christmas tree. I love its smell and you can’t really replace it with anything else. The only thing I like about the fake ones is that it looks better, fuller and you can decorate it earlier than a real one. 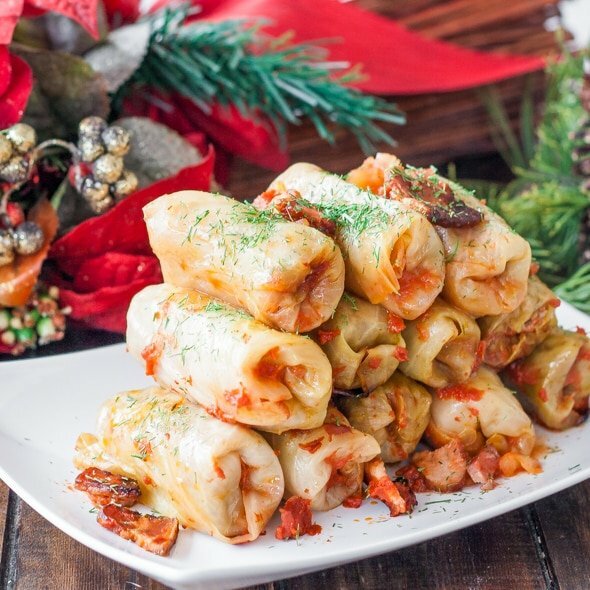 My favourite holiday food is Chicken Soup and Sarmale – this will translate to Cabbage Rolls. They are to die for! These 2 dishes were always my family’s festive main meals. I guess that’s why I love them so much. When it comes to cakes and sweets, I don’t really have many favourites, but if my mum will ask me what to bake for me I would definitely answer Rafaello or Snickers! These are my 2 absolute favourites! To be completely honest with you I like more giving than receiving simply because I love to make other people happy and love to see their reaction to my gift. But the more I think about it, I like them both equally, I think. Who doesn’t love receiving gifts?! Especially the ones you do to yourself. OMG! This is a hard question. I loved all my gifts and I couldn’t choose one only. If my favourite Christmas movie is Home alone, for sure my dream place to go to would be New York with the Rockefeller Tree. Some things are really hard to wrap, so that’s my main issue. But I would say that with a bit of practice I got a little bit better at it. Not quite sure what this question is referring to, so I am going to guess. This year’s memorable holiday moment was my son’s reaction to our Christmas Tree. We wanted it to be a surprise for him and it definitely was! His little reaction was so so precious. I’ll have it forever in my heart! haha, good question! Not sure when, but it was definitely a long long time ago. That’s my original answer, but now that I think about it, what truth?! I’ve had so many intentions to make new year’s resolutions, but I never made any. I would like to slowly incorporate them in my life simply because I think it’s a perfect way to motivate yourself to be a better version of yourself. There are a few things that make Christmas special for me. The first one would be family – spending time together, sitting around the festive table, going carolling and other fun stuff together as a family. The next one would be decorating the Christmas tree and gift giving, gift receiving. So all these little traditions together make everything special for me. I couldn’t really choose one thing. I remember when I was a little girl, I used to love Christmas because of the school break, going carolling to make some pocket money, but now, things have shifted a lot and it’s more about being with my family and doing things together. That’s a wrap for my Christmas Tag. This was so fun to write about, especially because Christmas is my favourite time of the year! So, now it’s your turn, share your answers in the comments or if you are a blogger, write your version and send me a link! I would love to read your answers too! Don’t forget to SAVE it for later!